It’s no secret via all of my social media accounts that I have been eating the new Farmstyle Greek Yogurt from Tillamook for the past few weeks. Thanks to Tillamook, they sent me this new yogurt line to check out all of the buzz. It is sold out in many stores and being devoured by many bloggers across the country. I decided to make a luscious, creamy, thick roasted Poblano yogurt sauce for these tacos. Using the Greek yogurt makes this cream sauce a healthier choice and adds a nice tang to the spiciness of the pepper. 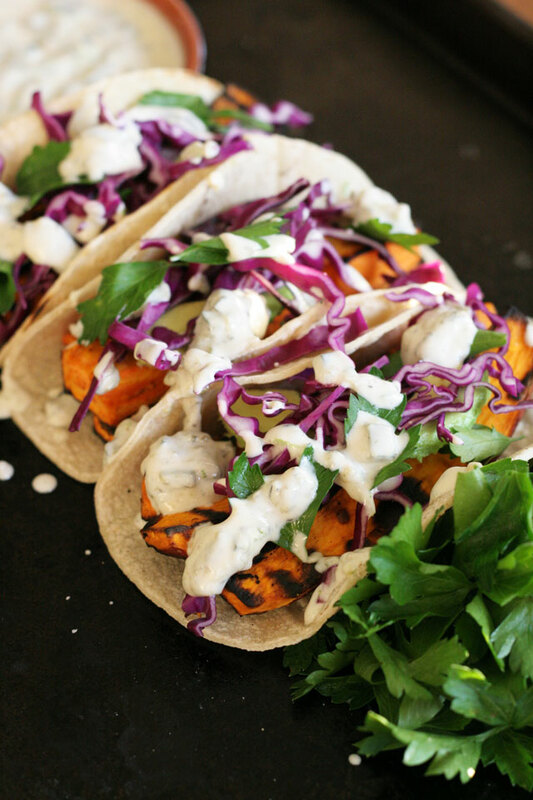 Grilled yam tacos has really never occurred to me until I was pursuing the internet and saw some other squash tacos. Thus the grilled yam taco recipe was born. Tillamook wants my readers to get a chance to taste their new line of yogurt, so I am giving away a package, sent to you directly from Tillamook. It will be packed full of several flavors of Farmstyle Greek Yogurt! Flavors include Strained thick Plain, Washington Raspberry, Oregon Strawberry, Coffee, and Vanilla Bean. Disclosure: I was sent a package of yogurt from Tillamook. 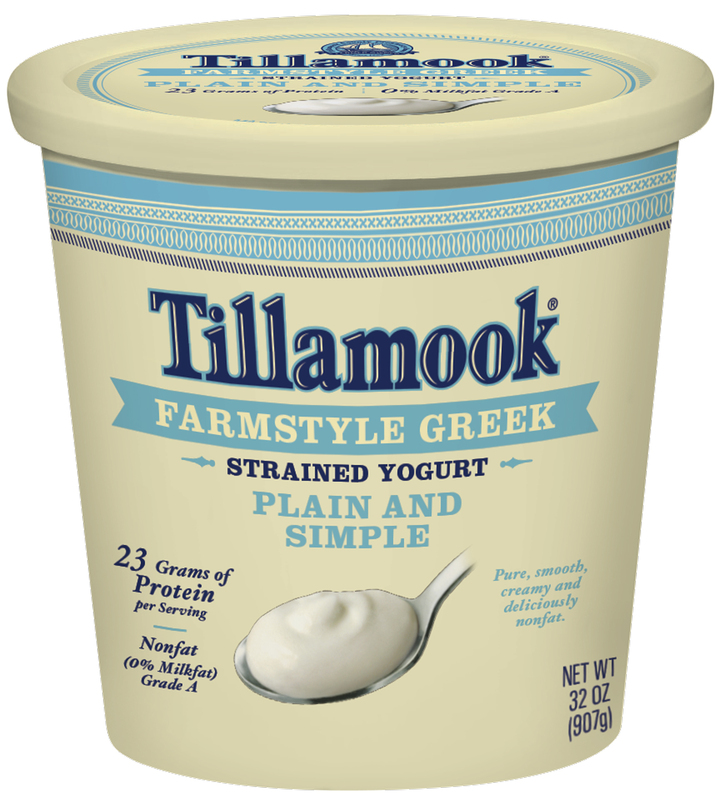 They are also providing the package of yogurt for the giveaway, sent directly to the winner from Tillamook. The sad part is, they can only send it to certain states. I am very sorry for this, but this is how it is. I will choose a winner at random on April 16, 2014, 12am PST. I will email the winner of the giveaway on April 17. The winner will then have 24 hours to respond. If I do not receive a response, I will choose another winner. If you enter the giveaway and do not live in the states mentioned above, I will choose another winner. Thank you for understanding! 1. “Like” Not Just Baked Facebook page AND leave a comment below letting me know you did so! If you already like my Facebook page, leave a comment below letting me know you do! Good luck! For an extra entry: Leave a comment letting me know, have you ever had squash tacos? Note: I found the easiest way to organize this recipe is as follows: I started our gas grill then worked on the yams, cut and “marinating”. Then put the yogurt sauce components together in a bowl, other than the Poblano pepper. Then get all of the garnish ready; lime, cabbage, and parsley. This way it is all ready when you come inside to lastly peel the pepper to add to the yogurt sauce that is all ready to go. 1. Place the yams, olive oil, salt and pepper in a large bowl, toss to combine, set side. Place the yogurt, lime zest, 1/2 teaspoon lime juice, 1/4 teaspoon salt, 1/4 teaspoon freshly ground pepper in small bowl, whisk to combine, set aside. 2. On the grill: first place the peppers over medium high heat to char. Rotate until charred evenly. Once charred evenly, place in a bowl, cover with a towel and steam for a few minutes. 3. Place the yams on the grill over medium heat, grill for 15 minutes. The last 5 minutes of yam grilling, place the tortillas on the grill to warm. Place in a tortilla warmer or clean kitchen towel to serve. When the yams are done, place them in a bowl, and keep covered while you peel the pepper. How to peel the pepper: Remove the charred skin, stem, and seeds. 4. Chop the pepper finely and add to the yogurt sauce, stir to combine. Taste for seasoning, add salt and pepper if needed. I served this as a “make a taco” as you go scenario. On the table: Grilled yams, roasted Poblano yogurt sauce, lime wedges, a bowl of sliced cabbage, and chopped parsley. HA! Thank you so much, I hope you try them. Thank you for telling everyone about it. Liked your Facebook page. Have not had squash tacos, but they sound great. 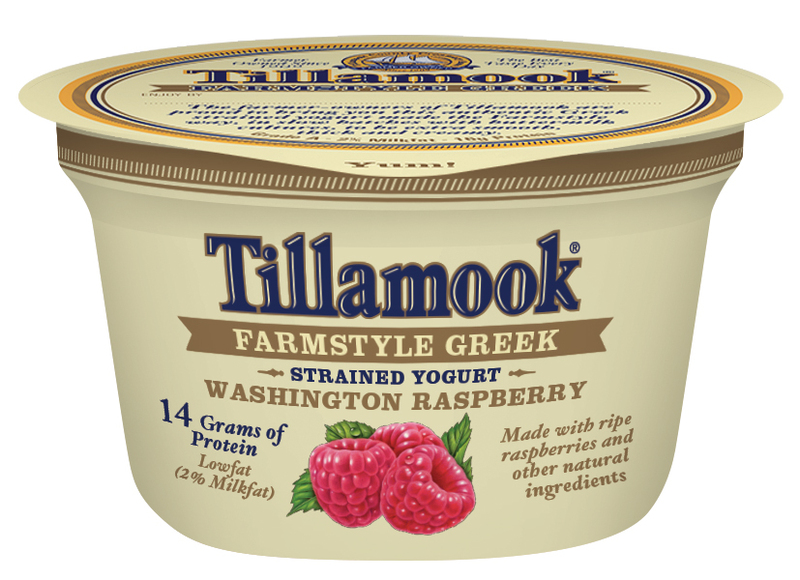 As soon as I can get my hands on some of that Tillamook Greek yogurt, I’ll try the recipe. Hi Bill! Thanks for liking my page and commenting here. I hope you’ll try these tacos of you win, they are great. 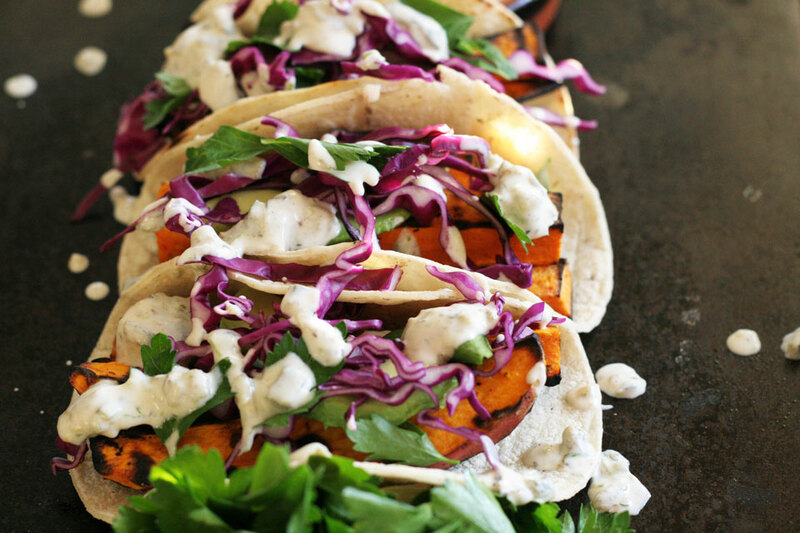 I haven’t had squash tacos, but I have had sweet potato tacos! I am a new follower!!!!! I love yams so this would be a wonderful recipe to try. Thank you for the giveaway! Hi Amber! Thanks for following. I appreciate it. Have a great weekend! I have eaten squash tacos, but they were nothing like this! Yam sounds like a much better plan, especially with that beautiful yogurt sauce. Thanks for the giveaway opportunity! Eileen recently posted..Grilled cheese, apples, pickles! Thank you so much, Eileen! Good luck! Let me know if you try them, and how you like them! I’m sooooo excited you won the giveaway!!! One of my longest readers, this is great! Email me your address please! You’re in Ca right?